Foreign nationals may legally enter the United States by obtaining a visa. There are two types of visas: immigrant and non-immigrant. Immigrant visas allow foreign nationals to enter and reside in the U.S. for the long term. Non-immigrant visas are issued for limited periods of time and for specific purposes, such as tourism, business, study, temporary work or medical treatment. Foreign nationals can legally enter the U.S. in a number of ways, including: as a student, as a family-based immigrant, as an employment-based immigrant, or as a refugee. The U.S. government also runs a Diversity Visa program - a random lottery that awards approximately 50,000 visas annually to foreign nationals who meet the strict eligibility requirements and are immigrating from countries with low rates of immigration to the U.S. There are two types of non-immigrant student visas available. The “F-1” visa is designed for foreign nationals pursuing academic studies or language training programs in the U.S. while the “M-1” visa is for those pursuing non-academic or vocational studies. Prospective students must first apply to study at a school that has been approved by the U.S. Citizenship and Immigration Services. Once admitted to the program of study, the school will provide the prospective student with the necessary forms to apply for a student visa. To enter the country as a family-based immigrant, an application on behalf of the foreign citizen must be made by a close relative who is a United States citizen or a permanent U.S. resident. Additionally, that family member must have an income that is at least 25% above the poverty level. 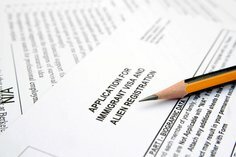 Spouses and fiancés of U.S. citizens have a few options to gain legal entry, which require the sponsoring citizen to file the application on behalf of the foreign citizen. Spouses can file a Petition for Alien Relative or request a non-immigrant visa for a spouse. Foreign nationals who are engaged to marry a U.S. citizen can also obtain a "fiancé visa." To legally enter the United States as an employment-based immigrant seeking permanent residence, the foreign-born immigrant’s employer must file an immigrant petition on his/her behalf. Typically, the employer must verify to the Department of Labor that there are no capable U.S. employees available to perform the job, or that the immigrant has attained a degree of excellence in his or her field. Employers who seek to hire a foreign worker on a temporary basis can request a non-immigrant visa on behalf of the foreign citizen. Foreign nationals who reside outside of the U.S. may also be able to enter the country as a refugee. To qualify, the refugee must demonstrate that there is a well-founded fear of persecution if he/she continues to reside in his/her country. Such persecution may be based on religion, race, national origin, membership in a particular social group or political beliefs.